A committee of Ukraine’s private creditors that hold about $10 billion in Ukrainian bonds is against any write-downs in its debt-restructuring deal. The bondholders’ terms jeopardize Ukraine’s bailout package from the IMF. Ukraine’s creditors are expecting a “speedy resolution” to negotiations “without any principal debt reductions,” the committee said in a statement released by Ukraine’s biggest bondholder Blackstone Group, Bloomberg reported Friday. The group was working on a plan that “provides Ukraine with the necessary financial liquidity support,” according to the statement. Ukraine has to pay about $10 billion to service its debt this year, including corporate and sovereign loans and bonds. The total debt of Ukraine is currently estimated at $50 billion. Public sector debt rose to 71 percent of Ukraine’s gross domestic product, and is due to rise to 94 percent of GDP in 2015, according to the National Bank of Ukraine. Meanwhile, Ukraine has to reach an agreement with creditors by the end of May to save $15.3 billion over 4 years as a condition for receiving the next tranche of a $17.5 billion International Monetary Fund loan which comes in exchange for economic, budget and monetary reforms in the country. A debt-to-gross domestic product ratio of below 71 percent by 2020; and the budget’s gross financing needs at an average of 10 percent of GDP from 2019 to 2025 are also among the restructuring demands from the IMF. “This is how restructuring negotiations always start, with unrealistic proposals. For sure, the creditors will try to achieve a deal with no principal reduction, but realistically it is not viable,” Michael Ganske, who helps manage $6 billion as head of emerging markets at Rogge Global Partners in London, told Bloomberg. “Ukraine’s debt-to-GDP is much too high and the economy is shrinking,” Ganske added. Russia is Ukraine’s second-biggest creditor as it holds a $3 billion Eurobond issued in December 2013 with a maturity in December2015. Moscow is not going to demand early repayment of the loan, despite the fact that one of the contract’s conditions was violated as Ukraine’s national debt exceeded 60 percent of the GDP, according to RIA Novosti. Meanwhile, Ukraine is seeking to restructure at least $21.7 billion of its public debt. 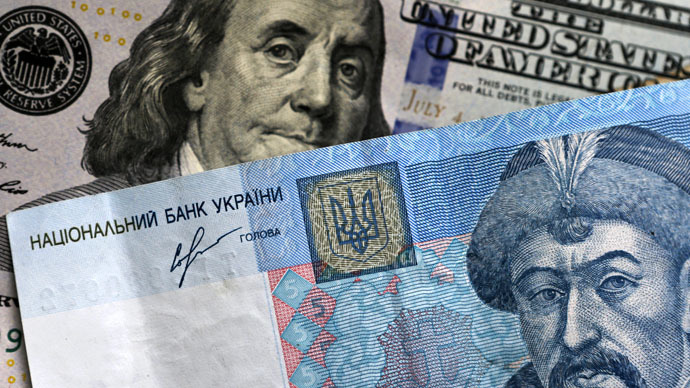 The country’s central bank reserves fell dangerously below $5.6 billion in February, and the national currency, the hryvnia, has lost more than half of its value in the past six months and emerged as the worst performing currency in 2014. Ukraine has thus been forced into negotiations with the bondholders. The weakening currency has led to massive inflation, which has reached 272 percent last year by some estimates. Officially it was 34.5 percent in annual terms as of February and is expected to reach 30 percent for the whole of 2015. Ukraine also has outstanding Russian energy debts now standing at about $2 billion that it must pay if it wants to continue receiving natural gas. In return for the IMF funds, Ukraine has embarked on tough economic reforms, which include cutting pensions, raising the retirement age, trimming the state budget, and getting rid of wasteful gas subsidies.